While cropped keyboards are small enough to carry in your bag, the lack of a number pad can be annoying. This app turns your iPhone or iPad into a number block with integrated trackpad. A great little helper while travelling or on the road, Number Pad will complement your MacBook with it's functionality. When used with the iPad It will give you a king-sized track. From now on, when you need a numeric keypad you can just place your iPhone next to your keyboard or your laptop and you are ready to go! Establish a connection to your iPhone or iPad and you are ready to go! Apps like the calculator or filling spreadsheets become so much more easier to use .... and you will wonder why you didn't do that before! Your iPad turns into a kingsize trackpad / mousepad. A bigger mouse pad grants more control when scrolling through a video or through a big site. Same goes for editing a photo from your personal album, control is king. A bigger trackpad rules when you need detailed control. Sliding a photo to share on tumblr, scrolling through big spreadsheets, swiping browser pages, all these tasks are done better on a bigger track pad. A complicated calculation usually makes you type a lot of numbers. Typing a lot of numbers becomes much more relaxed with a separate number block. Number pad recognizes multi gestures, as example slide 2 fingers up/down to scroll. Number Pad comes with a bunch of ready-to-use emojis. You can access this feature with the push of a button. Didn't you always want to have a separate emoji keyboard? I was always wondering if left handed people would like to use the number block on the side of the keyboard .... and maybe you aylways wanted to find out for yourself if that would be better. Of course, you can also hold it in your hand or place it in front of your MacBook. Place it wherever you want, that's the difference between separate and remote. As it is the case with a lot of things, the best keypad available is the one you have in our pocket. 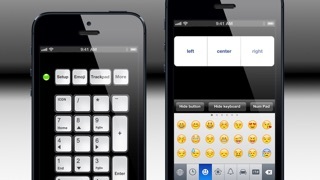 With Number Pad, your iPhone or iPad becomes your shortcut for relaxed typing. It is the kind of custom tool that you never want to miss again once you tried. Remove the missing number pad from your hotspot, Number Pad is your personal shortcut to make typing numbers a relaxed task, and helps you finishing your work faster and come to a finale, allowing you to concentrate on the things you enjoy most. Get Number Pad now, you won't regret!